Larger pieces for little fingers!! Much larger holes than metal Meccano. 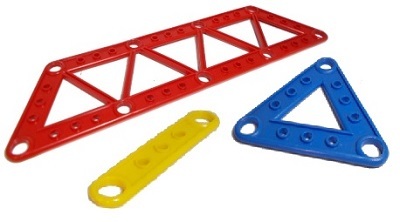 Original Meccano (Liverpool) parts which are also compatible with metal Meccano with the inclusion of smaller holes. These parts have the same hole size as Meccano (France) Junior Plastic parts, so are compatible, but the bolts have a different thread. These parts are similar to earlier Meccano (Liverpool) Junior Plastic Meccano by having the same hole size but have different threads for the bolts and nuts.